இந்தக் கட்டுரை பெரும் பிரித்தானியாத் தீவுகள் பற்றியது. தற்போதைய நாடு குறித்து, ஐக்கிய இராச்சியம் என்பதைப் பாருங்கள். 1707 முதல் 1801வரை நிலவிய நாட்டைக் குறித்து, பெரிய பிரித்தானிய இராச்சியம் என்பதைப் பாருங்கள். கப்பல் பற்றியான கட்டுரைக்கு, எஸ்எஸ் கிரேட் பிரிட்டைன் என்பதைப் பாருங்கள். ஏப்ரல் 6, 2002 அன்று நாசா செய்மதியால் எடுக்கப்பட்ட பாரிய பிரித்தானியாவின் மெய்வண்ணப் படிமம். ↑ 2.0 2.1 Figure refers to the population of the United Kingdom excluding Northern Ireland, and includes about 500,000 persons on smaller islands. ↑ , Oxford English Dictionary, http://oxforddictionaries.com/definition/Britain,+"Britain:/ˈbrɪt(ə)n/ the island containing England, Wales, and Scotland. The name is broadly synonymous with Great Britain, but the longer form is more usual for the political unit." 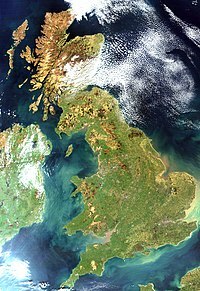 ↑ , Oxford English Dictionary, http://oxforddictionaries.com/definition/Great+Britain,+"Great Britain: England, Wales, and Scotland considered as a unit. The name is also often used loosely to refer to the United Kingdom." ↑ Pam Peters (2004). The Cambridge Guide to English Usage. Cambridge, England: Cambridge University Press. பக். 79. ISBN 052162181X. "The term Britain is familiar shorthand for Great Britain"
↑ Definitions and recommended usage varies. For example, the Oxford English Dictionary defines Britain as an island and Great Britain as a political unit formed by England, Scotland and Wales. whereas the Cambridge Guide to English Usage gives Britain as "familiar shorthand for Great Britain, the island which geographically contains England, Wales and Scotland". ↑ "Population Estimates". National Statistics Online. Newport, Wales: Office for National Statistics (24 June 2010). பார்த்த நாள் 24 September 2010. ↑ says 803 islands which have a distinguishable coastline on an Ordnance Survey map, and several thousand more exist which are too small to be shown as anything but a dot. விக்கிமீடியா பொதுவகத்தில் பெரிய பிரித்தானியா என்னும் தலைப்புடன் தொடர்புடைய பல ஊடகக் கோப்புகள் உள்ளன. இப்பக்கத்தைக் கடைசியாக 18 சனவரி 2018, 17:17 மணிக்குத் திருத்தினோம்.